Learn More About the All – on – Four Procedure in San Antonio! It is important to preserve your overall oral health, but sometimes decay, infection, or trauma causes teeth to go missing and oral health to deteriorate. In his San Antonio dental office, Dr. Craig Wright performs the All – on – Four procedure for patients looking to regain a full and healthy smile. What is the All – on – Four Procedure? The All – on – Four procedure is a restoration method involving four to six dental implants that are surgically placed into the jaw bone, and which support a full set of replacement teeth. The entire procedure may be done while the patient is under sedation and can be completed in a single dental appointment. Why Should You Choose All – on – Four? The All – on – Four method is a permanent solution for missing or damaged teeth. Patients can enjoy a fully functioning set of teeth that improves their appearance, as well as their eating, speaking, and digestion ability. 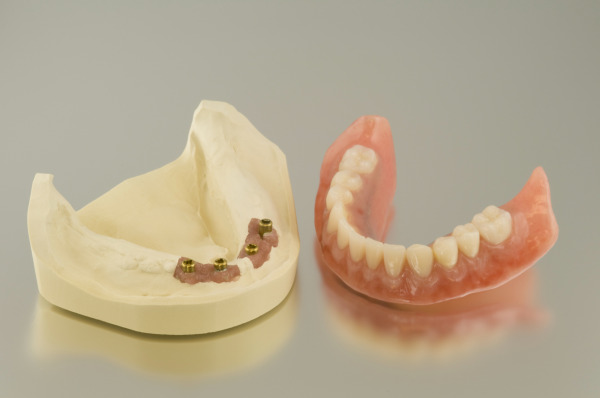 Unlike a complete set of dentures, the All – on – Four procedure is fixed into the jaw bone and therefore treated with the same oral hygiene as natural teeth. You no longer have to worry about additional cleaning methods or the overall embarrassment associated with dentures slipping out. Instead, you can regain your quality of life with a new set of teeth that last many years. Our goal is to provide the best dental care for your needs. During your scheduled consultation, Dr. Wright will perform a dental examination, as well as take x-rays and impressions in order to customize your All – on – Four denture. We take special care to address your concerns and provide comprehensive explanations of what your individual procedure will entail. After your clinical examination, your restoration will be fabricated, and on your surgery day, your remaining teeth will be removed and your implants and restoration will be placed. Follow-up appointments will be scheduled once your procedure has been completed, and after a six-month healing period with temporary teeth, new impressions of your teeth will be taken and a more durable set of teeth will be fitted onto the implants. Dental implants can improve your appearance as well your overall oral health. For more information about the All – on – Four procedure, or to schedule a consultation with Dr. Wright, call our San Antonio dental office today!